Here is a great interview that our resident retreat host Becky Nodding did with Bekabuluh ‘The Traveling Gardener’ entitled “The Coconut Oil Wonders”. As Indonesians, most of us have heard this since elementary school: Coconut is the most useful plant there is. You can weave its leaves into baskets; turn the leaves’ ribs and the shell’s fiber into brooms; use the trunks for building homes; or use the shells as a firewood alternative. And who can deny the freshness of young coconut water on a hot day? Or just how delicious coconut milk can be in various creamy local dishes? Lately, coconut oil has also been considered as superfood for its high nutrient and health benefits. There indeed is a lot of goodness you can get from coconut. My wonderful friend Becky Nodding, holistic nutritinist and retreat host with Natural Instinct Healing — a health, fasting, cleansing, and yoga retreat in Ubud, Bali — has been using coconut oil to look after her skin, teeth, and hair for 10 years. In this first interview post on BEKABULUH, the 40-year-old Canadian will share with you why coconut oil may be the only body care product you will ever need to have in your travel bag, if not in your life. If you promise to be good and read this post until the very end, you’ll be rewarded with her favorite coconut ice cream recipe as well! BEKABULUH (BB): When did you start using coconut oil for body care? Becky Nodding (BN): Perhaps 10 years ago during my Canadian School of Natural Nutrition (CSNN) days when I started working in health food stores. BB: How did you first find out about the benefits of coconut oil? It’s interesting to hear about people’s first encounter with cool stuff. BN: During a CSNN nutrition class. We were encouraged to apply some of the theories and knowledge we were learning about. Coconut oil came with so many positives that it was exciting to see what the results would be. Some of us lost weight, some gained more mental clarity, others’ skin became more smooth and healthy, and all of us felt our immune system was stronger. BB: But there are experts warning people that the trans-fat in coconut oil makes it unfit for consumption. How do you respond to that as a nutritionist? BN: There’s a great book, The Coconut Oil Miracle by Bruce Fife. [In it he says:] “If coconut oil did have any adverse health effects associated with it, we would see it reflected in the mortality rates of countries that consume it in high quantities.” Yet they are among the healthiest people in the world. It is funny we know that deep frying causes free radicals that destroy our cells, yet we all line up at Makker’s [McDonalds] and KFC. Having said that, though, any oil that is used for cooking that begins to smoke is carcinogenic. Toss it out, clean the pan, and add fresh! BB: Do you use coconut oil every day other than for cooking? BN: Yes, multiple times a day depending on the day. Have you heard of “oil pulling”? BB: For the teeth right? BN: Yes, for teeth and gum health, as well as many other health benefits like pulling toxins and heavy metals out of the body, so make sure you spit it out. I also use coconut oil for moisturizing my skin, at the same time it is protecting me from the sun. Not that I think the sun is bad. Coconut oil is a natural sun screen, so you do not get too much sun. BB: Other than for teeth, as sun screen, and as skin moisturizer, what else do you suggest people use coconut oil for, body-care-wise? BN: Your hair will be stronger and shine if you use a small amount like a leave-in conditioner. A little goes a long way! And soap as well. Mix with your favorite essential oils like lavender, lemon, et cetera. Add water [and stir], it will emulsify. Okay maybe not as much as with adding SLS [sodium lauryl sulfate]. Lather up. Leave it on your skin for a few minutes, rinse [and then towel up]. Mmm, squeaky clean! You will find your skin heals more quickly as well when using coconut oil. It has anti-viral, anti-parasitic, and anti-fungal properties. Coconut oil also makes a great base for personalized perfume just for you. Again, add your favorite essential nice-smelling oils to coconut oil. My combo at the moment is cinnamon, vanilla, with a hint of patchouli. BB: I love adding gardenia. BN: Oh gardenia is amazing! BB: I have tried coconut oil shampoo, which uses glycerin as the only synthetic chemical. Do you know if glycerin really is safe for your skin and hair? BN: Glycerin can be veggie-based and used as a sweetener. A lot of raw foodies use it instead of honey or fruit so they stay within the food combining guidelines. BB: Do these beauty recipes last long for storage? BN: That is the upside. You can change the composition and ingredients until you perfect whatever it is you are making — shampoo, moisturizer, soap, conditioner, et cetera. However, coconut oil is a natural product and therefore has a shelf life that is less than the synthetic options. BB: There are different kinds of coconut oil, like there’s one for cooking, and there’s VCO [virgin coconut oil]. Which one do you suggest people use for body care? BN: Virgin, cold-pressed coconut oil is the strongest choice for cooking as well as body care. BB: With all these wonders of coconut oil, what do you say to Indonesians who used to use coconut oil for cooking but then turned to palm oil because of all of those ads and campaigns? BN: Wow, that’s an easy one. Go back to the “old way.” It tastes better, is better for you, is most likely in your back yard or at least in the local market, and saves the natural habitat of the orangutan. It is known as the “Tree of Life” to so many. Everything about coconut is health-promoting, so it’s easy to share recipes, ideas, and info. And we are surrounded by an abundance of them in different colors, shapes, and sizes. BB: And Indonesia is just blessed with how easy all the different species of coconut grow here. If only people here all know how lucky we are. Is it easy to find coconut oil in northern America? BN: It is easy if you know where to look. Most health food stores carry a few brands to choose from. Choose a brand that uses dark containers, preferably glass, and is kept out of direct sunlight. 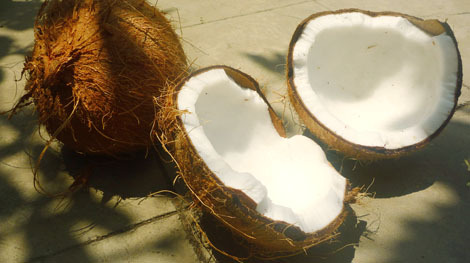 BB: It’s been a pleasure learning all of these coconut recipes for body care from you. BN: The ones I know are yours! I also love coconut oil in smoothies. Creamy deliciousness. BN: Sure. Blend some papaya, young coconut flesh, one tablespoon coconut oil, coconut water, fresh lime, and a pisang susu if you want a delishhh smoothie or pop it in the freezer for a healthy ice cream treat. BB: Oh my God, I am so making that! BN: Keep in mind it is a saturated fat, so it will harden quickly, so not long in the freezer. Not that we could possibly wait long anyway! Source: All images and script from Bekabuluh – online here.